The 24th Street Project is in phase one of it's four-part timeline. You've probably been stuck in it—the traffic and construction on 23rd and 24th street over that last few months. Although the project is still in its early phases, city officials are optimistic that the new construction will help, not only with traffic congestion, but with flooding. "The 24th Street Improvement Project is to basically add an additional lane in each direction on 24th street and 23rd street,” said Nick Fidler, Director of the city’s Public Works department. But the construction isn't just to battle the congestion. .
"Right now you'll see a lot of the new storm drain conduits and pipes being installed on 23rd street," said Fidler. The project broke ground in October of 2018 but faced opposition early as more than 20 homes needed to be demolished in order to expand the street. 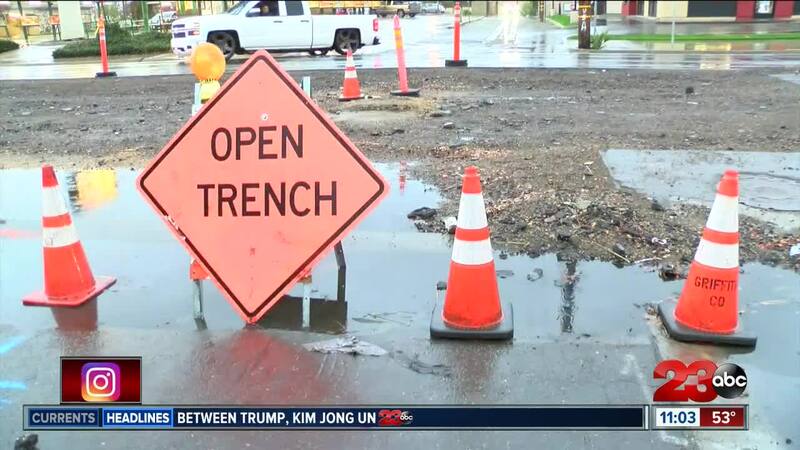 The road work is also aiming to help out during Bakersfield's rainy season, which typically leads to flooding in downtown. "The 24th street corridor has been susceptible to flooding over the years. The new system replaces the existing system by increasing the capacity to allow for more water flow," said Fidler. In the meantime, officials are reminding drivers to give themselves extra time when heading downtown or use an alternate route. Officials say depending on progress on this project, construction may extend to neighboring streets as well. The entire project is expected to be complete by the spring of 2020.